In 1919 when World War I had just finished and people all over the world took to the task of peace, Very Rev. Fr. M. J. Le Goc the Rector of St. Joseph's College, Colombo had a vision of a College in the southern suburbs of Colombo. Since the classrooms at St. Joseph's were full and couldn't admit any more students, a new school was the answer to this problem which will educate those who couldn't be admitted to St. Joseph's due to the lack of accommodation. While he was traveling one day on his famous motor bicycle with this idea in mind, Fr. Le Goc spotted a block of cinnamon land in Bambalapitiya which belonged to Mr. E. C. de Fonseka. The land in which St. Peter's now stands has a rich history itself. 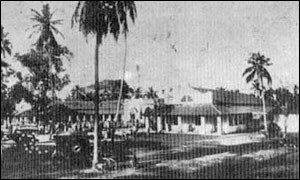 According to documents, Colonel de Meuron owned the land in the late Dutch period which was called "Kelan Kaduwatte". In 1789 Seesma Lebbe bought the land from the colonel for 1200 rix dollars. C.P Layard sold the land to Don Joseph de Silva £81. The Rathnayake Muhandiram in1867. The land was in the Rathnayake Muhandiram's Family till Mr. E.L.F. de Soysa, the well known racing enthusiast passes the ownership of the land to Mr. E. C. Fonseka, who then sold the 9-1/2 acres of the land to the Archbishop Antony Coudert of Colombo for Rs. 75,000/= in the year 1921. The news of a school was released to the public at the silver jubilee celebrations of St. Joseph 's College. The work began on the 7th of July 1921 and was rapidly carried under the supervision of Mr. J.R.J. Jayasuriya, an old boy of St. Joseph 's College. In December that year Fr. 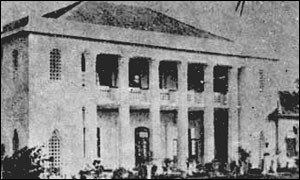 Le Goc had confidently announced at the Josephine prize giving that St. Joseph 's College South will be open in January, 1922. The buildings were designed by Rev. Fr. Le Goc himself and because of his enthusiasm the buildings sprung up in six months. The quadrangle in front had an oval drive running around it, a familiar feature of English schools. Fr. Le Goc introduced the concept of open air class- rooms, an idea which was daily coming into existence in English Schools. The classrooms had a platform running through the entire breath so that the teacher was in an elevated position. All around the building there were spacious corridors which were 8ft. wide and a Vestibule at the middle of the entire block. On the right hand wing , were the living quarters of the President of the institution Rev. Fr. J. Nicholas Perera O.M.I. on the other wing were also quarters for a Parish Priest, Fr. Lejuene. As mentioned before the school stood on block of land of 9-1/2 acres in extend with a road frontage of 324 feet. The body of the building which ran parallel to the road was 230 feet in length. Two arms stretched forward from either end, their extremities rising symmetrically 150 feet from the road. A large portion jutted out from the center, out of a wide open passage, which cut the main building in two. Thus the whole scene from the road was shaped in the form of an "E" with the base running from the south to the north. The building occupied a ground area of 18,450 sq.ft. and was portioned into six open air classrooms, three closed class rooms, the other rooms could be used as classrooms were all 26x 20ft. each. The building included rooms for teachers, bedrooms for the clergy, offices, a dinning room and sitting room for the fathers- in – charge and the chapel with pews with accommodation for 250 persons, measuring 60x 25ft. The sanctuary being situated at the northern angel of the building, the capacity of the chapel could be increased when necessary by opening out the folding the partitions of the three open air class rooms. By the same process, the class rooms could be converted into an Assembly Hall whenever it was needed. The main block of buildings, was supplemented by others covering an area of 1,829 ft. This section had the kitchen, a pantry, servant's room, and the store room. The most notable portion in this section was the boys tiffin room. The inauguration was a happy day for Fr. Le Goc, Rector St. Joseph's College. The opening of St. Joseph 's College, Colombo South was scheduled for Wednesday 18 th January 1922, at 3.30p.m. The school was specially decorated for the occasion with flags and bunting. The railway Department had made special arrangement for the conveyance of the students of St. Joseph 's College who were participating for the ceremony. On the 18th January 1922, boys, masters and priest waving the college colours wended their way to the Maradana Railway Station to board a special train to Wellawatte where they had detrained and waded their way to the new school near the sea. Fr. Le. Goc, the first rector of St. Joseph 's College South followed by about forty priests, blessed the altar of the school chapel and then the building. The opening ceremony took place in the presence of a large gathering. A total number of 204 students were admitted on that day and by the end of the year the number had risen to 268. 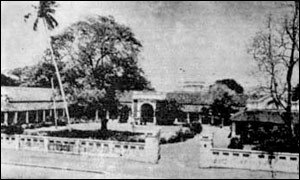 The first prize distribution was held in December 1922, with Very. Rev. Fr. M.J. Le Goc the founder and the Rector as the Chief Guest. It was Fr. Le Goc's patient study of the education system, his great foresight, his power of planning and his personality of converting an idea into a reality that gave birth to St. Peter's College formally known as St. Joseph 's College South. The most important date in the history of the college is April 8th 1927. The College estamblished its own identity that day. 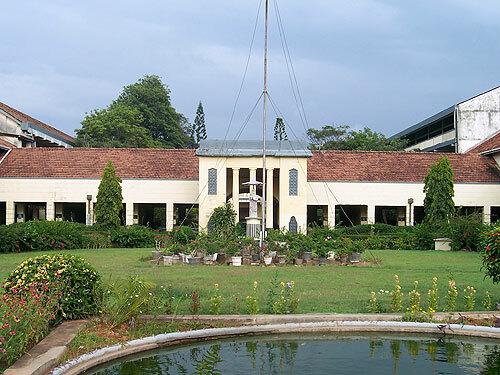 The Wellawatte branch of St. Joseph 's College Colombo was registered as a separate secondary school by Gazette notification No: 7575 of 2nd April, 1927 with the name St. Peter's College, Wellawatte. The celebrations in connection with the re-naming of the College had been held on Wednesday, 29th June with the feast of St. Peter with a high mass sung by Very. Rev. Fr. M. J. Le Goc assisted by Rev. Fr. Morel and Theobald Silva. After mass, a colourful ceremony took place on the lawn in front of the college. The College flag with the colours blue, white and gold was blessed by Rev. Fr. Le Goc and hoisted. The year 1972 dawned with memories of that historic and glorious day when St. Peter's was inaugurated on 18th January 1922. It was celebrated with jubilation, thanks giving and a bit of reflection of the five decades that had passed. Teachers, parents, old boys, benefactors and the students had a reason to celebrate the fifty years of endeavour and achievement. The celebrations commenced with a re-enactment of the event with 200 Josephians walking along Darley Road to the Maradana Railway Station and the train stopped at the vary same place as it did fifty years ago when they were being led by Fr. Maurice Le Goc along Kinross Avenue. The Josephians were led by their Rector Rev. Fr. Mervyn Weerakkody, Rev. Fr. Marcellinc Jayakody and Rev. Fr. Lucien Dep and were welcomed by the Peterite Band playing both college anthems. Lt. Heraclitus Jayasekera of St. Peter's was there with the Peterites to welcome them. Mr. J. A. A. Perera an Old Josephian, the only surviving person who had participated in the 1922 event was there too. The Rector Rev. Fr. Theodore Peiris welcomed the Josephians and a special Assembly was held in the Quadrangle. The celebration concluded on 22nd January, 1922 with the Thanksgiving Mass concelebrated by His Eminence Thomas Cardinal Cooray, Archbishop of Colombo. Monday, 18th January, 1982 St Peter's recorded its sixty years of service in the field of education since the Archbishop Coudert blessed and opened the new school, St. Joseph 's College South in 1922. The occasion was celebrated in a fitting manner with a large and representative congregation that attended the concelebrated thanksgiving mass held in the open air college quadrangle. The Mass was held in the presence of sixty priests who concelebrated the mass with the Chief celebrant His Lordship Oswald Gomis, the auxiliary Bishop of Colombo. His Eminence Thomas Cardinal Cooray, Archbishop Emeritus of Colombo and their Lordship Frank Marcus Fernando and Edmund Fernando O.M.I. were also present. Due to the great strides made in a short time in the fields of studies, sports and the improvement in discipline under the leadership of Fr. Wickremasinghe resulted in large the number of applications being received for new admissions. In order to cope this situation, two new houses were added in the Diamond Jubilee year, Basil House named after the second rector Rev. Fr. Basil A. Wiratunga O.M.I. and Arthur House named after the third Rector Rev. Fr. Arthur N. Fernando. These houses participated for the first time in the Diamond Jubilee athletic Meet held on June, 26th 1982. In the diamond Jubilee year, the College Cadet platoon was re-introduced after a lapse of twenty years. More significant however was the elevation on the 15th July, 1982 of the first Old boy Bishop, Rev. Fr. Dr. Henry Joy Gunawardene as the first Bishop of the new Diocese of Anuradhapura – He paid an official visit to College and was given a fitting reception. Also, the Nancy Emily Wickremasinghe Scholarship was established in the Diamond Jubilee Year which was awarded to the best student entering University presented by a loyal Old boy Mr. Anton Wickremasinghe, Chairman of the Film Corporation. The diamond Jubilee celebration came to a close with the prize giving held on 3rd of December, 1982, where His Excellency J.R. Jayawardene President of Democratic Socialist Republic of Sri Lanka was the Chief Guest. On this day the College hall was named as the 'Nicholas Perera Hall' after its builder. The plaque was unveiled by President J.R. Jayawardene.